In Spello, men at work — on flowers. mbria lets you to experience layers of history going back hundreds and often thousand of years. Sometimes our B&B guests are surprised to hear that one of our rooms was part of a 16th-century watchtower. We don’t’ consider this particularly unusual since we know people who live in buildings significantly older than our own. Take for example the hill-town of Spello, which rests on the slopes of the Subasio Mountain, a short trip from our home near Assisi. The town itself consists of a smattering of 14th-century homes made from local — and extravagantly pink — limestone, and is surrounded by a 1-1/2 mile stretch of well-preserved Roman walls. The fortifications date back to the 20-30 BC, the time of Emperor Augustus, and the town accessible through five gates flanked by majestic 12-sided towers — the Torri di Properzio — dedicated to Venus. Old has a literal meaning here. As you walk through the narrow alleys, you can easily convince yourself that Venus, goddess of love and beauty, might still be Spello’s guardian angel. Spello casts an almost instant charm, and not only because of the unreal pinkness of its stones or its consummate ancientness, but also for the profusion of flowers that adorn walls and hang from clay pots in seemingly every one of the town’s nooks and crannies. Since there’s not much space between the buildings — they’re mostly perched on a mountain spur — the Spellani (citizens of Spello) have built splendid vertical gardens, a colorful victory over the town’s wild natural surroundings. 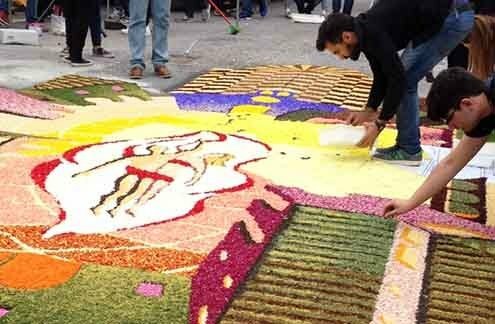 The passion the Spellani have for flowers culminates annually in one of Italy’s loveliest festivals, The Infiorata, a Christian version of the Roman spring celebrations known as Floralia. More than 2,000 people work for months in preparation for the final all-night labor before the Feast of Corpus Christi. In the months before the festival, old and young townsfolk gather to pick thousands of flowers, pick the petals, and then sort them according to colors, grinding, shredding, and pulverizing the plants for use in their works of art. The night before the feast they lay out intricate, mile-long floral petal carpets that cover streets and piazzas and must be ready before the morning Procession of Corpus Domini. If you don’t mind the crowds, the procession is a joy to watch. We prefer to visit in the peace of early morning, when the bleary eyed infioratori (flower artists) are putting on the finishing touches. We get to enjoy the flamboyant colors in relative peace. By the evening, this celebration is over and Spello reacquires the status of a sleepy cute village, allowing Venus to rest. Tired, we go back to our not-so-ancient home and enjoy a simple meal, one that reflects the colors and aromas of a warm day. 1 onion, cleaned and sliced. 1 tablespoon basil or parsley, chopped. — Over medium heat, sauté zucchini and onions in 2 tablespoons of olive oil until just tender. Whisk the eggs with the grated cheese. Season with salt and pepper, add herbs and egg mixture to the zucchini, stir lightly and cover. Cook over low heat until firm. Serve immediately. A former behavioral ecologist, Italian-born Letizia left academia with husband Ruurd to renovate a 500-year-old Umbrian farmhouse they turned into a B&B and cooking school named Alla Madonna del Piatto . 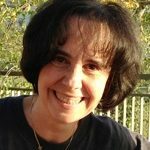 She maintains a blog and in 2015 published a cookbook called "A Kitchen With a View."